In the modern world, more than 6 million students opt to take higher education courses online for distance, time management, or personal reasons. For example, if you are enrolled in Tulsa Welding School’s welding technology program to become a welding inspector, you may opt to take select upper level classes online. Keep in mind that online courses require a high level of self-motivation, focus and perseverance. A student needs to understand his or her own role in online training to succeed in a virtual classroom. Follow these five tips to help your online class go smoothly. If you have visited the store or gone anywhere in town lately, you know that technology advances very rapidly. According to U.S. News, you must ensure you are able to meet all of the technical requirements of an online course in order to succeed. This includes having up-to-date computing systems and compatible technology with course requirements. Before enrolling in an online course, also check that you can obtain any physical supplies needed to complete your studies, especially specific tools for vocational programs like welding. According to James Littlefield of About Education, one of the best means of succeeding in an online course is to stay ahead of yourself. Avoid the temptation to wait until an instructor assigns a reading project. Instead, read ahead. Even though you have not yet studied the material with an instructor, this will enable you to review the material and ask questions during online lectures or during assignments. You will receive a syllabus of requirements for your online course; however, the syllabus does not dictate when you must prepare for an exam, study for a skills test, or prepare the best methods for completing your coursework. Create a daily schedule of your planned time for studying, and stick to it. Set aside a time and place for studying, which may be indoors or outdoors. Many students choose online learning when they do not live in close proximity to the actual campus; however, this means students have almost total control over when to study. Avoid setting your study zone in areas of high-activity of your home; i.e. do not study in the living room. Nearly everyone has a Facebook, Twitter, or other social media account that is only seconds from becoming a day-long distraction. When you open your computer for school, you need to treat it the same way you would if you were sitting in class. Do you remember the days of having your cellphone or other digital device taken away by the teacher? Now, you need to be that teacher if you hope to survive online education. Do not open any social media pages until after you have completed your coursework. Once you have finished, reward yourself with a game of Words With Friends or whatever you enjoy doing on social media. If you find yourself engaging in social media or other distractions on YouTube, consider installing a lockdown browser. These forms of free browsers only allow you to open one page at a time, and they prevent you from traveling to other areas on your computer. Many online students do not ask questions about their coursework due to the fear of ridicule. If you are experiencing trouble understanding a concept, ask your online classroom peers or the instructor about the topic. Instructors understand that online courses can be difficult, and they want you to succeed. Each online student is a representation of the instructor’s skills; in general, have an open-communication policy with your peers and instructor. If you have been struggling with your online courses, you may need to overhaul your current ways of studying. By following these five tips for online success, you should be able to pass and be proud of your online coursework. 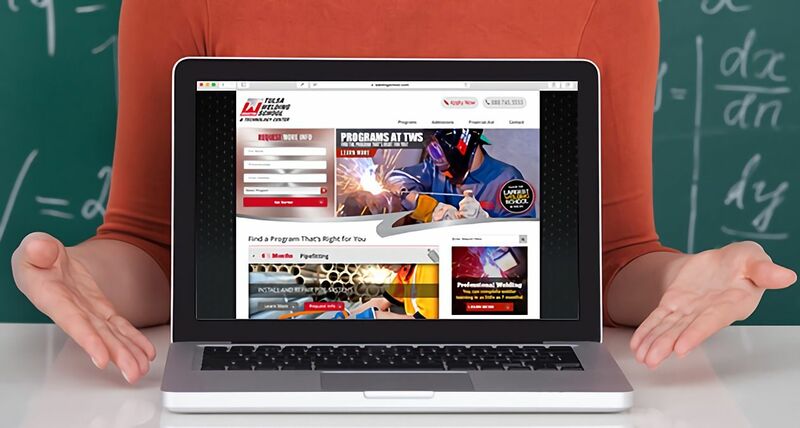 To learn about online welding courses offered at TWS, contact a representative today.